We've been working hard to make MatrixPilot ever more modular, and to test this modularization, I thought it would be fun to build a LOGO-like mission planning language as a plug-in replacement for the existing waypoints module. my activity on this site has been low for the past year as i have been up to my ears with starting a business and developing a few products for us to sell . I would encourage anyone reading this to take a good long look at my profile so as to understand my background and my history with the diydrones community . Here's a copy of our Deliverable 2 video that we presented for entry into the 2010 UAV Outback Challenge. 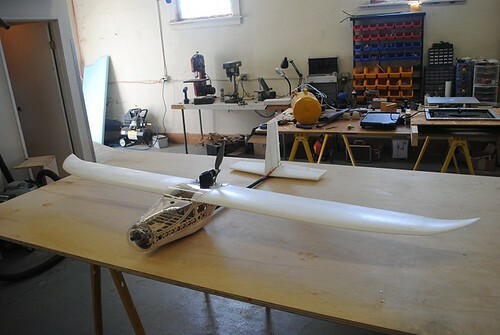 We are using a Penguin-B UAV airframe from UAVFactory(.com) its a very stable platform and as seen in the video it is flying at an AUW of 15kg (~30lb) and tootling along at 1/3rd throttle. 3D Robotics Last week to drop an egg! Developer Choose your equipment carefully. With the profusion of low-cost components available today, it's tempting to pick the cheapest one that looks like it will do the job and not stop to think too hard about how well it's going to work. After all, if it's for sale and other people are using it, it must be OK, right? sonar altitude for $25 on APmega! Take a look at the mod I made for the mega to incorporate a sonar range finder. DIY Reflow Soldering - Ready for Pizza? Here's the demo of my gamecube remote controlling my quad. Newly implemented is the ability to adjust the PID.P value on the field using just the remote. This method can be implemented with the analog remotes most people use. I've got another remote that uses only analog sticks to drive a menu system. Something similar could be done for the main AeroQuad project if anyone is interested. I think we should hack this baby for a laser altimeter. Please use http://code.google.com/p/ardupilot/issues to report any problems. Moderator HG3 the era of quad variable pitch has begun! This is last post from Pipposoft as lot of work this is a new version of HG3.2 Variable Pitch Propeller. For my first post I thought I'd give back to the community (and edit later to add anything else I can do). I am currently working on 3D position and attitude etimation of my indoor drone. I use a 6 Dof IMU, a 3D magnetometer, and 4 sonars (Devantech). The gumstix overo is literally the size of a stick of gum. This will show BASIC functionality of how to get the UAV DevBoard and the ArduPilot working. The rest is up to your imagination and the recipes you come up with and the add ons you want as well. I am sure there may be cleaner and better ways to interface the two but this was the easiest for me to be able to get the functions on board the plane i needed.